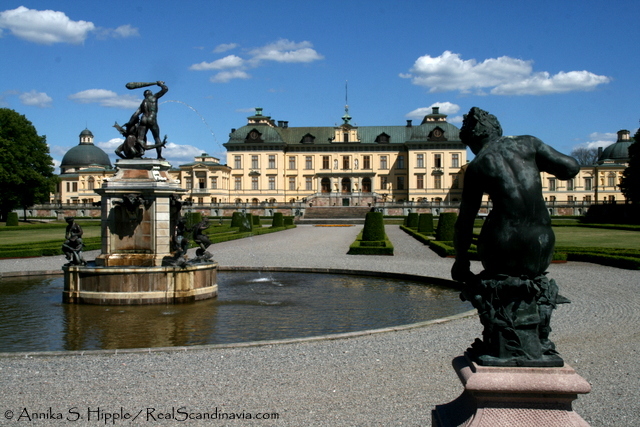 Annika S. Hipple of RealScandinavia.com takes you on a day trip to Drottninghom, a UNESCO World Heritage site and the residence of the Swedish royal family. Construction was begun in 1662 by the great Swedish architect Nicodemus Tessin the Elder and took several decades to complete. Tessin himself did not live to see the finished palace; however, after his death his son, the equally renowned Nicodemus Tessin the Younger, completed the project. The mostly baroque structure is surrounded by extensive gardens reflecting various eras. The interior of the palace has undergone various alterations but retains much of its original baroque decoration. Since 1981, Drottningholm has been the primary home of the Swedish royal family. A museum on the grounds contains the world’s largest collection of statues by the 16th century Dutch sculptor Adriaen deVries, brought to Sweden from Prague and Denmark as plunder during wars in the 1600s. Bronze casts of the sculptures are now displayed in the Drottningholm palace gardens where the originals once stood. Next to the palace, Drottningholms Slottsteater (Drottningholm Court Theater) is a fascinating example of an 18th-century theater. Designed in 1776 for Queen Lovisa Ulrika, it enjoyed its first heyday during the reign of the “Theater King” Gustav III, beginning in 1777. Following Gustav’s murder in 1792, the theater lay mostly unused for nearly 130 years, but since the 1920s it has undergone a revival. A renowned summer opera and ballet festival takes place at the theater every year from late May to late August. Productions still use the original hand-operated stage machinery. Also on the Drottningholm grounds, the small pleasure pavilion known as Kina Slott (the Chinese Pavilion) is one of the best-preserved examples in Europe of the 18th-century fashion for all things Chinese. It was a birthday gift from King Adolf Fredrik to Queen Lovisa Ulrika in 1753. The present building, erected in the 1760s, was designed by Carl Fredrik Adelcrantz and blends Chinese-inspired design with French rococo. The interior features red, green, blue and yellow rooms decorated with lacquer and East Asian fabrics. The pavilion houses a collection of Chinese and Japanese porcelain and other decorative arts. Nearby is a cluster of workers’ houses from the 1750s built for the weavers who created the fabrics and tapestries used to decorate the pavilion. It’s possible to get to Drottningholm by bus (subway to Brommaplan, then bus 301-323 or 177-178), but the more scenic way is to make the approach by sea. Sightseeing boats depart from Stadshuskajen (City Hall Quay) in central Stockholm. The journey takes one hour; round-trip tickets are good on any return boat the same day. Entrance fees include a guided tour of Drottningholm Palace. Opening hours vary by season. For current opening hours and guided tour schedules, visit the Drottningholm website. 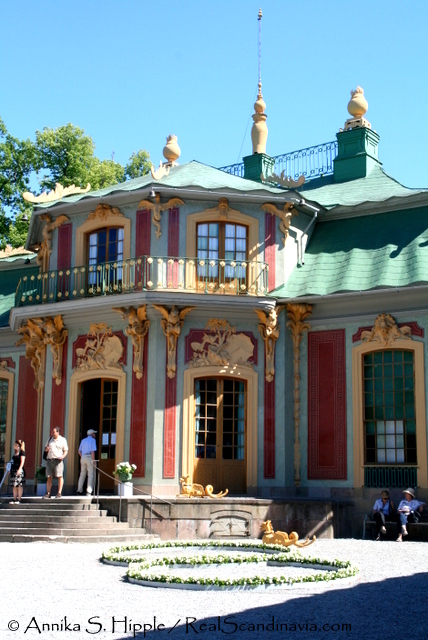 The Chinese Pavilion requires a separate admission fee; however, during the summer months, combination tickets (145 SEK for adults and 75 SEK for children/students) are available that include both Drottningholm Palace and the Chinese Pavilion. Guided tours of the Drottningholm Court Theater are also available for an additional admission fee (90 SEK for adults and 70 SEK for students; children under 16 admitted free in the company of an adult). Combination tickets are available. Tickets to stage productions are available through the theater’s website, by phone or through Ticnet. This article was originally published at Real Scandinavia: The Insider’s Guide to Norway, Sweden, Denmark, and Beyond. Annika S. Hipple is a freelance writer, editor, and photographer. With a Swedish mother and a Swedish-speaking American father (an “honorary Swede”), Annika grew up bilingual and bicultural, calling both the United States and Sweden home. Annika’s work has appeared in a wide range of print and online publications, and she also provides writing and editing services to clients in travel, sustainability, and related fields. She publishes the website Real Scandinavia: The Insider's Guide to Travel in Norway, Sweden, Denmark, and Beyond.